Starting out with the Daytona 500 and branching out the next twenty years to include quality work gloves in their line, Mechanix Wear spares nothing when it comes to impressive craftsmanship that will get the job done. 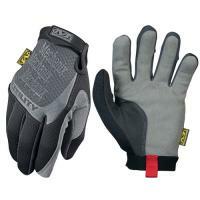 The All Purpose Utility gloves are ideally-suited for daily use. Utilizing TrekDry® fitted fabric, wearers have ample insulation and protection from heat. The ergonomic design of the dual-paneled palm prevents bunching and provides lasting wearer comfort. Reinforcing the thumb and index finger as well as the Thermal Plastic Rubber (TPR) wrist closure, fitting flush to the wrist, ensures longevity and safeguards your hands during household chores, repairs, or other tasks your active lifestyle demands.